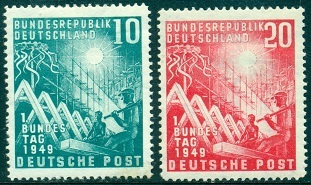 The new post-war Federal Republic of Germany issued its first postage stamps shortly after its formation in May 1949. 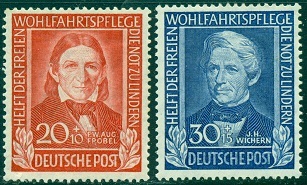 The two stamps shown above (Mi. #111-112, Sc. #665-66) were issued on September 7, 1949 for "Bundestag 1949" or "Federation Day 1949", and they commemorate the opening of the first Federal Assembly of the new republic. The new stamps were lithographed, perforated 14, and watermarked multiple "D P", and the designs depict symbols of reconstruction. The three stamps shown above (Mi. #113-5, Sc. #667-68, #B309) were issued on September 30, 1949 to celebrate the 100th Anniversary of German (Bavarian) postage stamps. These stamps were lithographed, perforated 13 3/4 x 14, and watermarked wavy lines. 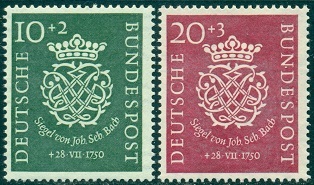 The charity stamp issue at the left shows the 1 Kreuzer denomination issued by the Kingdom of Bavaria in November 1849. The two commemorative postage stamps at the right depict the 3 Kr. and 6 Kr. stamp denominations, also issued by the Kingdom of Bavaria during late 1849. The stamp shown above (Mi. #116, Sc. #669) was issued on October 9, 1949 to commemorate the 75th Anniversary of the Universal Postal Union. These stamps were lithographed, perforated 14, and watermarked multiple "D P". The design features line depictions of the General Post Office in Berlin and of the Guild Hall in Bern, Switzerland, where the Universal Postal Union is headquartered. 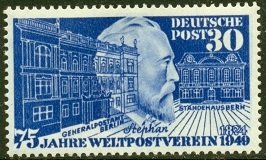 The central design of the stamp features the profile head of Heinrich von Stephan (1831-1897). Having started out as a postal clerk in the Prussian postal service from 1849, Heinrich von Stephen was named the postal director of the North German Confederation in 1870, and in 1876, he was made the Postmaster General of the German Empire. He was responsible for the reorganization of the German postal service and was instrumental in the founding of the Universal Postal Union in 1874. In 1877, he also introduced the telephone to Germany. With the issue of the four stamps shown above (Mi. #117-20, Sc. #B310-13) on December 14, 1949, the Federal Republic of Germany began the annual tradition of special charity stamp issues to coincide with the Winter holidays. These stamps were engraved, perforated 13 3/4 x 13, and are watermarked multiple "DP". The surcharges on these issues went to aid public charities. 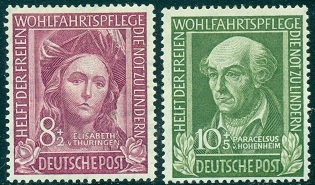 The 1949 issues depict famous Germans associated with charity. They are as follows. 08 Pf. + 02 Pf. - St. Elizabeth of Thuringen (1207-1231). She built a hospital for the poor and sick at Marburg, where she personally administered to the sick. 10 Pf. + 05 Pf. - Paracelsus (1493-1541). Paracelsus was a Swiss-German Renaissance physician, botanist, alchemist, and astrologer. Paracelsus pioneered the use of chemicals and minerals in medicine. 20 Pf. + 10 Pf. - Friedrich Fröbel (1782-1852). Fröbel laid the foundation for modern education based on the recognition that children have unique needs and capabilities. He created the concept of the “kindergarten” and also coined the word now used in German and English. 30 Pf. + 15 Pf. - Johann Wichern (1808-1881). Wichern studied theology at Göttingen and Berlin, and, settling in Hamburg, devoted himself to missionary work among the poor. These charity stamps remained on sale through March 1951. Only two stamps were issued by the Federal Republic of Germany in 1950, and they are shown in the scan above (Mi. #121-22, Sc. #B314-15). This set of charity stamps was issued on July 28 to commemorate the 200th Anniversary of the death of Johann Sebastian Bach. The two stamps are engraved, perforated 13 3/4 x 14, watermarked multiple "DP", and the designs feature the crest of Johann Sebastian Bach.